North Korea (NOKO) tested 9 missiles in 2017 but none in 2018. The United States successfully tested one of its SDI (Strategic Defense Initiative) missiles on May 30, 2017, launching it from Vandenberg Air Force Base in California. It shot down a missile that was launched from the Marshall Islands in the Pacific Ocean. In the recent past it was successful only about 50% of the time, however, with recent improvements, it looks like it’s successful all of the time. This is very important to the security of South Korea, Japan, and Hawaii, all of which are currently within reach of NOKO’s missiles. Very shortly, the U.S. mainland will also be within reach of NOKO’s missiles. Were it not for President Ronald Reagan, the U.S. would not have this “star wars” capability today. Russian General Secretary Gorbachev pressed Reagan at their nuclear summit in Reykjavik, Iceland in 1986, but Reagan walked out of the talks rather than give up his Strategic Defense Initiative, nicknamed “starwars”. The Democrat Congress tried to stop its development back then, as well as it and Democrat presidents up to the present, giving the Democrat Party the nickname the “Treason Party”. NOKO has thousands of conventional artiliary aimed at Seoul,South Korea, many in hardened bunkers. If the U.S. tried to destroy NOKO’s missile facilities, NOKO could kill at least a million South Koreans before all of their arsenal was obliterated by the U.S.. NOKO has the third largest army, after the U.S. and China. The U.S. recently tried to deploy its one-billion-dollar THAD anti-missile system in South Korea, as well as three aircraft carriers in the waters surrounding North Korea. Ninety percent of NOKO’s trading is with China, making China very influential over NOKO. President Trump pressured China to coerce NOKO to stop testing its missiles and meet with President Trump. China, plus strong trade sanctions, convinced NOKO. Previous presidents tried bribing NOKO, but NOKO did not keep any of its agreements with the U.S.
Life in North Korea, with the exception of its capitol, Pyongyang, is a living hell, with little food and electricity and government overwhelmingly horrible, similar to life depicted in George Orwell’s book, 1984, as explained in Barbara’s Demick’s book on NOKO, Nothing to Envy. However, North Koreans have been brainwashed to the extent that they worship Kim Jong-un, his father and grandfather as gods and believe all of the propaganda that the government presents. Pyongyang sounds like a chapter out of the book, Stepford Wives. To live there, a North Korean and his/her family must live an impeccable life, 100% loyal and obedient. 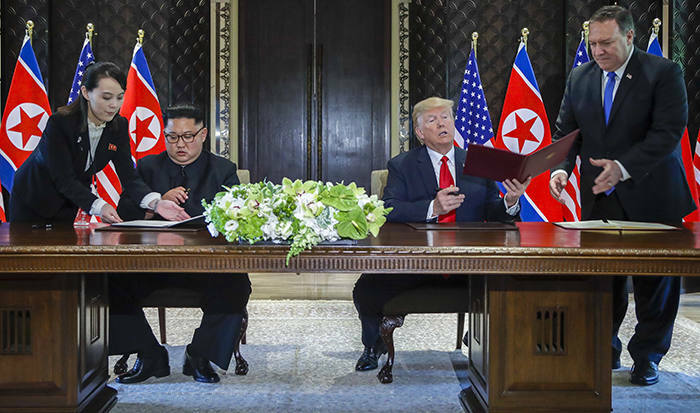 What will happen as a result of the Singapore Summit and the agreement Trump and Kim signed that NOKO will denuclearize? No one can know for sure because NOKO has previously lied and cheated, however, I believe that President Trump’s unique personality and the strong team he has assembled makes him and his administration distinctly capable of guiding the U.S. through these dangerous times.